I am always looking for a good solution (not a software, but a solution) to manage all my contacts and calendar. Actually I separate both of them, even they are under PIM (personal information management). I was using an excel file to manage all my contacts. But we know, a file is different from an application, the interface is not usable, and I had the difficulty to find the contacts that I want. Then, I tried to use EssentialPIM (freeware) to manage all my contacts. Yes, this is really a good solution, including the contacts with contact number only. Besides that, I can also use the task and calendar. However, the task and the calendar are not good enough to solve my problem, because I need to run EssentialPIM and check the calendar or task manually. Because of the calendar and task problems, I switched to Rainlendar. This is very good, because it shows everything about calendar and task on the desktop. Useful to remind me to do the tasks. The next problem of EssentialPIM is the email. Since it is used for only contacts, when I want to email, I need to run it, copy the email address, and paste it. These are exhaustive, wasteful, and boring actions. Why don’t I switch to Thunderbird for all the contacts including email? Now, since I have multiple computers, syncing is a big problem. Rainlendar’s calendar can be synced easily, but Thunderbird address book is different. So, to solve the syncing problem, the best way is using online service. Thus, to solve the calendar syncing problem, finally I use the Google Calendar. It is too good, because it can send email to remind the uncompleted task. To make me access Google Calendar more conveniently, I installed Lightning add-on for Thunderbird, and load the Google Calendar. Besides that, I use the Cache feature of Lightning, so that even I cannot access internet, I can still load the calendar from the cache. This is the best solution for me currently. Now, the calendar is solved, but the contacts is the next problem. Because I didn’t manage the contacts online, thus all the contacts in the accounts like Google and Yahoo are very messy. I normally manage my contacts offline. Calendar can be shared among the applications because of the standard iCalendar format. But contacts are different. There are Google format CSV, Thunderbird LDIF, Outlook CSV, vCard, etc. This makes the import and export very difficult to preserve all the information. I tried to use Thunderbird Google Contacts add-on to sync the contacts with Google. However, the result is not very satisfying. I cannot sync all the contacts with Google. Finally, I tried to use Zindus add-on for Thunderbird. Yes, this can sync very well, all the contacts are syncing correctly. As a result, I manage the contacts with Google. The best feature I like about Google is merge the duplicated contacts. Now, I can sync the contacts and calendar with all my devices. Previously, I compared ChromePlus and SRWare Iron. Today, I think ChromePlus is better. Google Chrome 6.x beta already released. But SRWare Iron still using Chromium 4.x. That is why, I tried out ChromePlus, which uses Chromium 5.x. And there is no problem to play the WMA files. So, I choose ChromePlus now. Besides that, there is also Linux version for ChromePlus. Written by using C and C++, depends on GTK+ and Expat. I spent about 3 days to study GTK+ and Expat since never used them before. 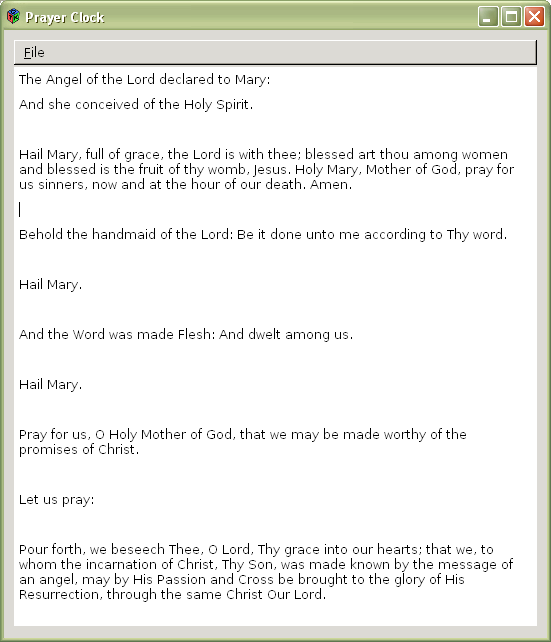 I wrote this application because sometimes, I want to say a prayer, especially Angelus. But I need the prayer to read and also a reminder. 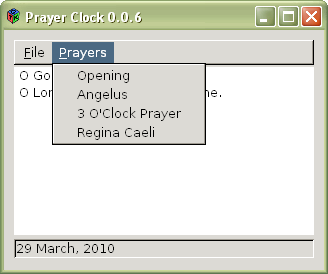 So, I decided to wrote this program, at the same time I can also learn about GTK+ and Expat. And I decided to open source it as a contribution to Catholics. I upload it with the source code included. Click here to download. There is a lot of improvements can be added. After running the program, minimise it. Then at 6:00 am, 12:00 am, and 6:00 pm, the window will pop-up with Angelus. At 3:00 pm, 3 o’clock prayer to the Divine Mercy will pop-up. I like GIMP (Portable). But it is an advanced image editor, and need some times to load the application. Thus, it is not a good idea to run the GIMP for doing tiny works. So, I am looking some other image editor, free and cross-platform (better if open source). One of the popular image editors is Paint.NET. I tried it, it is nice and lighter than GIMP. But it depends on .NET Framework. I don’t like .NET Framework because it is “heavy” (required a lot of disk space). Thus, I want to find alternative.